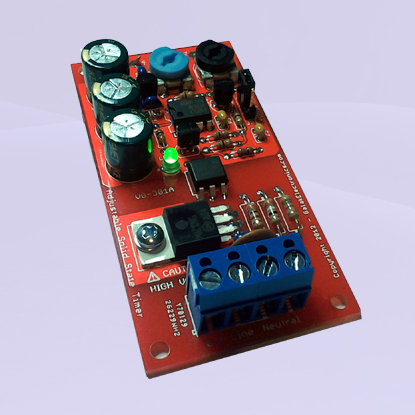 The unassembled kit includes instructions (including schematic and parts placement) and all the components to build one complete Solid State Adjustable AC Timer. A soldering iron, solder and a pair of cutters are required for assembly. 120VAC or 240VAC output at 10A max* with 4 terminal connector for easy inline integration. * Maximum current rating is at 158°F (70°C) ambient. Heat sinking is required for average loads exceeding 5A.